Today was a kitchen day. It didn’t start out to be, but it certainly ended up as such. For whatever reason, I thought about making my own pico de gallo, but I started out with a little tomato, mozzarella and basil salad. Nothing to that… just dice up some Roma tomatoes, put them in a bowl with some cubed mozzarella (use part skim mozzarella for a little more health benefit), them I add just plain Italian salad dressing and some basil (fresh, if I have it, dried if not). Cover the bowl after tossing the salad, put it in the fridge, and it’ll be ready to go in an hour or so. I followed that up by seeding and dicing more tomatoes and some red onion. I’ve never attempted to make pico before, but I’ve had it enough to figure out what I need. Just not sure if I got the proportions right. I also don’t have any cilantro, so I let the tomatoes and onions soak in the lime juice and will add cilantro when I get to the store. I know it needs to sit awhile, so no worries. One tip, if you’re going to make something like this, make sure you seed the tomatoes. If not, you have a mess. It’s really easy to do. Just quarter a tomato and use a spoon to scrape out the seeds. It’s really easy with Roma tomatoes, since they don’t have much in the of seeds to begin with. The other task I undertook was to make some marinated sirloin for burrito use. I looked at a few recipes and decided to improvise. I took a can of chipotle peppers in adobo sauce, pureed them in a blender, then I forced them through a strainer to get rid of the seeds. To this puree, I added half of a red onion, some cumin, oregano, garlic and black pepper, ran it through the blender, dumped it in plastic bag with some sirloin tenders we located on clearance at the Greatest Grocery Store on the Planet. Picked the steak up on a good deal as it was about to hit its sell-by date. I’ll let the meat marinade overnight and grill it up on the morning to see what happens. 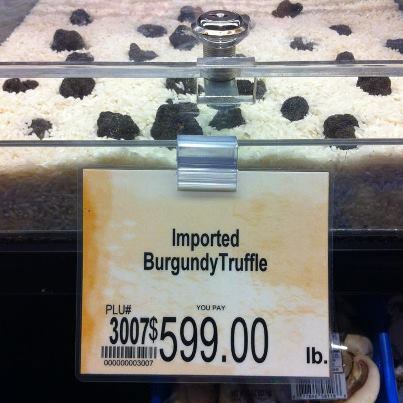 Truffles, however, were NOT a good deal. Seems like the price fluctuates with the season. In other news, we picked up a lot of ingredients to make a food contribution for a project we have in the offing. I’m cooking up a baked pasta dish with a choice of meat sauce or marinara sauce. That little project will keep us busy the next couple of weeks. I’m kind of doing it on the fly, but it’s pasta. Hard to mess that up. Blood glucose reading this morning was 114. Pretty happy with that. It’s staying a lot more stable, which is a good thing. It was fluctuating wildly for a few months, plus, I wasn’t checking it as regularly as I should have been. Gotta toe the line if I want to succeed. Anyways, back to work tonight. I have my first ever trainees… this should prove to be interesting.